Information collected from various sources is called raw data. The technique that leverages processing of raw data in order to obtain vital data that can help engineer the business and manifest the policies that can help growth of the organization is called Business Intelligence (BI). For example, let us consider two organizations A and B selling electric trimmers and jewelry for women, respectively. When these organizations want engage the customers through their ad campaigns, following are some of the observations that can be pure gold for the organizations. Ads should be prioritized based upon the gender. An ad should be displayed only if there is a prior search of the product. The brand value of both the organization can be estimated. The threshold usage of a product by the customers can be estimated for organization A. The age group and respective modes of high sale can be identified for organization B. The period of time when the sales reach the highest point can be figured out. Colloquially stating, BI helps to narrow down the target customers for a given product for enhancing the business. Any service provider providing the BI services is called Business Intelligence Service Provider. Strictly speaking, BI is a comprehensive term; there are various processes or procedures that help in extracting the true utility from BI to the Business Intelligence service providers. Following are the generic steps that a Business Intelligence service provider can implement to extract the best out of a given set of data. The process of analyzing and modelling the data in order to extract useful information and conclusions is called Data Analytics (DA). It is majorly implemented in B2C business model, which helps a business intelligence service provider in better decision-making. The process of implementing various analytical techniques in order to discover various patterns and occurrences of events in a given set of data is called Data Mining (DM). The process of keen observation of current trends, based upon which a solution is anticipated and the organization is planned accordingly, in order to enhance the business is called the Observe, Anticipate and Plan (OAP) approach. The process in which the design and analysis of workflow of a give business is reframed in order to deliver better customer service and reduce operations costs called Business Process Reengineering (BRP). There are four steps involved in BRP. The process of comparing the various parameters of a business entity with that of the best practices of the industry, in order to deliver quality products is called Benchmarking. There are three costs involving in the implementation of benchmarking - Visit costs, Time costs and Benchmarking database costs. Enterprise Data Warehousing (EDW), otherwise called Data Warehousing (DWH) is the process used for data reporting and analysis. Data Mart, Predictive Analytics, Online Analytical Processing (OLAP) and Online Transaction Processing (OLTP) are different forms of Data warehousing. The process of delivering data that helps in extracting accurate conclusions after the data is processed using various techniques is called Data Reporting. Data reporting produces current status of any given business, in order to estimate the performance in the industry. The procedure that a business intelligence service provider follows for copying a given set of data from one or more source databases to a destination database is called Extract-Transform-Load (ETL) and the tools used for copying are called ETL tools. ETL, as the name itself conveys, involves in three steps. Extraction - Extraction of data from a homogeneous or heterogeneous source. Transformation - Transformation of the extracted data that the destination demands. Loading - Loading the transformed data into the destination database. SAP Data Services, SAS Data Management, Talend Studio for Data Integration, IBM Infosphere Information Server are the most common ETL tools used in the industry. Data Warehouse is an enterprise system that helps an organization (business intelligence service provider) for reporting and data analysis. Usually Data Warehouse is a database that is hosted on a cloud in the modern day computing. Data in these clouds is usually stored in the form of records for easy search and retrieval. There are three major components in every Data Warehouse unit. Data source - The point where data originates. Data staging area - The point where data is segregated and formatted for easy access. Data presentation - The point where data is presented when requested for. Online Analytical Processing (OLAP) is a technique that helps in analyzing a given set of data from different points of view and deduce a conclusion. Usually this is one of the most valuable services provided by a business intelligence service provider. The majority use of OLAP is found in the contexts like planning, analyzing the trend of certain product, estimating the sales of a product based upon the previous sales etc. Data in Data Warehouses is stored in the form of tables called Dimensional Tables and there are five analytical operations that can be performed on these tables. As the name suggests, an Online Transaction Processing (OLTP) System processes transactions, where database queries are usually called transactions. For any business intelligence service provider, OLTP systems are potentially used in the applications where there is high frequency of database access. On the other hand, OLTP systems used in commercial applications, where there is a high frequency of transactions like ATMs, mail orders etc. An OLTP system is preferred over other systems when there is a need of concurrency and minimal error margin. The process of analyzing a given set of raw data in order to extract useful data from the raw data is called Data Mining. With respect to the amount of data that is being generated in the modern world, analysis should be done on huge data, where the usual computers outrun the processing capacity. In order to process such huge amounts of data efficiently and effectively, the business intelligence service providers utilize Data Mining Servers (DMS). The word Ad Hoc means “for this” and a report is a document with data organized in a specific format to server a given purpose. In Ad Hoc reporting, reports are usually generated by non-technical users, without the involvement of a business intelligence service provider, in order to achieve a particular goal. As server that serves this purpose is called Ad Hoc Reporting server. When compared to that of a Data mining server, Ad Hoc reporting servers are cost effective. A server that can be accessed remotely independent of the geographical locations and the device from which the data being accessed is called Cloud Data server. Most of the servers that the business intelligence service providers use in the modern day computing are cloud data servers. When compared to conventional servers, the cloud data servers are efficient in terms of data access and data availability. Google Cloud, Microsoft Azure, Amazon Web Services are the most common examples of Cloud Data servers. Insights of customer behaviour - With BI, requirements of customers can be precisely understood. With all the real-time customer insights, decision making can be made more accurately. With BI, a wide range of market can be studied so that the trends of the market can be understood. For a given product, the peak time of the sales and then manufacture the product based upon the demand. BI helps in understanding the demand of the market and supply product based upon the requirements precisely. Opting for BI for small and medium scale industries in expensive. It is difficult to figure out the exact parameter that can leverage decision making, as enormously huge data is available. Even a minute vulnerability can affect the business completely. The business intelligence service providers can provide their services in various sectors. Following is the list of few areas the business intelligence service providers can extend their services effectively. For health forecasting based on current diagnostics. To avoid overdose of medicine. To enable easy insurance claims and renewals. To analyze the cause of certain rare diseases. To predict future trends of market. For customer insights and behaviour. To obtain analytics and optimize business. To understand and analyze competition for a given product. To balance inbound and outbound deliveries. For enhanced supply management chain. To provide better customer interaction. To provide infrastructure effectively to the students. To understand the interests of the students and deem syllabus accordingly. To provide personal courses for dull students. To device methods of effective learning. To enhance operational chances for a given business. To improve the standards for price fixing. To achieve effective product promotion. To provide optimized communication infrastructure. To identify potentially emergency areas and provide services accordingly. To reach more customer to improve services. To figure out any point of failure,handoff, call drop, average call duration and other parameters. To provide better services based upon the quality of service. To provide loans to the really needed customers. To decide upon branch optimization. To optimize revenue distribution among different branches of a bank. To provide effective interests based upon various parameters. To understand the flow of revenue across the society. With the development of BI there are many example where the business intelligence service providers played a major role in providing solutions to various challenges faced by technology. Numerous cases were registered where patients were severely affected due to over dosage of medicine. BI help in identifying the most accurate amount of medicine to be prescribed. To manufacture a given model of a mobile based upon the demand so that the production cost can be optimized. For a logistics firm, warehouse is one of the major investments and a larger warehouse is required when the business is expanding. BI acts as the platform that helps understanding the business expansion and to decide upon the need of warehouse. An arts student may not be interested in studying a regional language and an engineering student may not be bothered about History. In order to understand the interests based upon the insights from the students, a personal curriculum can be designed so that the complete potential of a student is harnessed. Rate of Interest is one of the major factors that seems to be hurdle for many people below the poverty line. BI helps in organizing the Rate of Interest based upon various parameters so that a customer in need can really gets fruitful service from the bank investment. Handoff is one of the major problems in the modern cellular world. BI helps telecommunication sector to study the reasons for handoff and provide solution and enhanced service to the customers. Business Intelligence is a collective term that business intelligence service providers use to represent the usage of intelligence into business. But based upon the application, BI is usually categorized into four type, which are further divided into subcategories. Reporting BI completely focuses on producing various artefacts like documents for a given set of data. For example, when there is a set of visitor insights data of a given website, then the business intelligence service provider takes help of Reporting BI software for documenting all the key conclusion extracted from the data like, the average number of visitors over a given time period, peak time of visitors etc. Analysis BI focuses on the origin of certain parameter. For example, analyzing the age group of customers for a given product. Analysis BI is further divided into three categories - Spreadsheet Analysis, Ad-Hoc Query Analysis, Visualization tools. Monitoring BI, as the name indicates, focuses on monitoring the data in real-time and make decisions on-the-go. Monitoring BI is very useful when there is a need to make a decision in real-time. There are three subcategories in Monitoring BI - Dashboard, Key Performance Indicators (KPI) and Business Performance Management. Prediction BI is mainly useful in predictive analysis like forecasting the demand of a given product in the market. There are two subcategories of Prediction BI - Data Mining and Predictive Modelling. 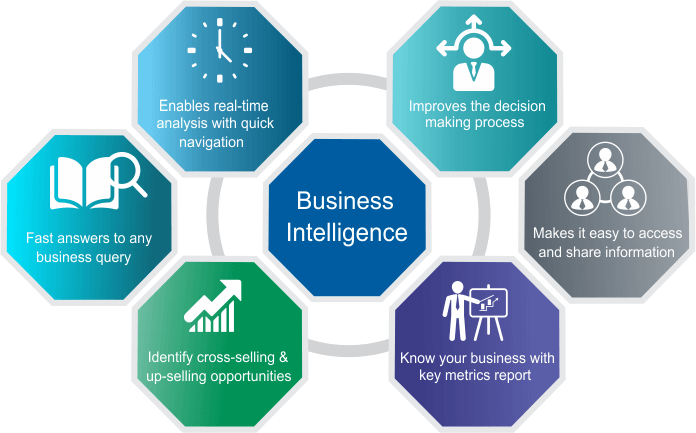 For any business intelligence service provider to be success to extract the best out of the Business Intelligence software, the six characteristics mentioned below are to be complied with. The metrics that which an organization is built upon should align with the strategy of implementation. All of these strategies should be executed by committed leaders in order to achieve the collective target of the organization. Every metric of the organization should add a value to the organization. In the process of business expansion, every new metric added should also drive value to the organizational goals. Every metric that decides the organizational goals should be executable. For example, the target should be like achieving a sales of 110% (which is easily executable) rather than 200% (which is hard to execute) for an unbiased product in the market. With the best quality delivered when a given product is launched, the quality of the product over a period of time should not deteriorate. A consistency in quality of a product creates a brand value to the product, which cannot be achieved in any other mean. Interdependencies are highly applicable for a business chain. Profits from one firm can be the investment for another firm of the business chain. Such interdependencies should be maintained in such a way that the overall business remains unaffected. With all the paved abundant information about Business Intelligence, Codigion affirms all of these parameters and provides its unmatching services to a wide range of customers across the globe. With fully equipped infrastructure that can potentially provide the best BI services to the customers, Codigion stands as one of the major Business Intelligence service providers of India. Just like any other service provided by Codigion, Business Intelligence is also served by a dedicated team of experts who have their experience with highly rated Business Intelligence service providers. There are many words that Codigion can put on, being a Business Intelligence service provider but all our testimonials from our customers speak. As mentioned in the characteristics of a successful business intelligence service provider, Codigion sticks to all of these characteristics being the best example of a real-time implementation of BI and its utilities.